Reading has always been a great love of mine. Since an early age, I have been an avid reader, and have continued as such. My range of taste is vast and never ending. So long as the plot catches me I'll likely read it. This is a co-written work between Bridget Essex and Natalie Vivien. I have read several of Essex's work and a couple of Vivien's. Both are very talented authors and I look forward to each new work of theirs. However this piece while engaging and very imaginative was not as good as I expected it to be. 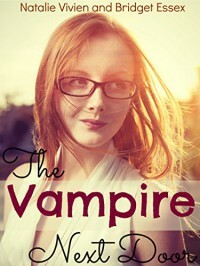 I'm a huge fan of vampire literature and other peoples take on different characteristics they may or may not have. Add in lesbians and you have me sold! The world itself is set up like an alternative United States where it's only been a few years since vampires have come out of hiding. In this world, they even have a woman president who is also a vampire. Props. Throughout the story, it shows the discrimination vampires face, which is similar to what homosexuals and persons of color have faced throughout all over the world. Just a lot hate mongering from people who don't want to understand someone whose different from them. Which is a very interesting take and imaginative in my opinion. I even like the main character and her to be love interest. It's very sweet and romantic. But the elephant in the room that I could not ignore was the fact that the main character Courtney; is still in a relationship. I will interject and say that she doesn't cheat on her girlfriend, but it's clear she's attracted to Lare. (her to be love interest) Throughout the story, you come to find out that her girlfriend, Mia isn't very good to Courtney. In fact, she's downright sleazy if you ask me. She looks at other women is clearly sleeping around on her girlfriend. The kicker? They have only been together for FIVE months. Mia has been doing all this to someone who she has only been going out with for a short period of time. Which is frustrating that Courtney continues to put up with her for nearly sixty percent of this book. All while feeling a deep pull towards Lare. I could see it being hard if it was like five years, and the other woman was good to her. But there's really no real reason why they should still be together in any sense of the word. There are multiple examples of times where Courtney should have left Mia. But she doesn't. It makes zero sense to me and after a while it just got old. Especially when she keeps repeating that she needs to leave Mia but she keeps avoiding it. There was really just no need of this back and forth over a five-month relationship. It just really dimensioned the book as a whole; that wasn't even super long, to begin with. This could have been much better and I wish it had been because I do adore both authors works. That aside I will continue to look forward to their work, but this one just didn't quite resonate with me as well as I had hoped for it too.